A new ebook startup crossed my desk this morning (found via DBW) which I think has a hidden potential for helping readers find new books to buy still generating revenues for publishers. 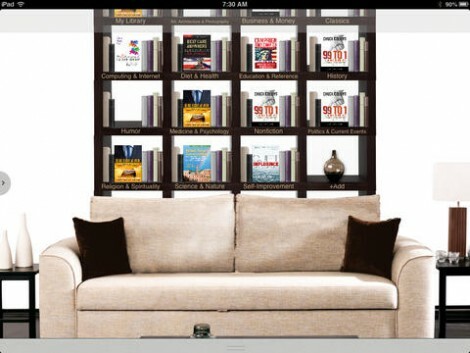 iFlipd is a two year old startup that wants to adapt the weekly rental idea from movies to ebooks. It was founded in late 2012, raised $200,000 last November, and according to AngelList.co they are currently trying to raise $1.4 million. The service is currently only available to iPad owners, but an Android app is in the works. The iPad app is buggy (it won't work right on my iPad 2), but nevertheless I am still intrigued by the idea that iFlipd is trying to promote. I haven't had a chance to use the iFlipd app (the interface hangs off the bottom left corner of my screen). iFlipd also uses a faux book design for reading ebooks, which turns me off. Nevertheless I am still interested in iFlipd. In spite of the technical issues, I think this is a platform worth investing in. The business model for iFlipd might repel the major publishers ($2 for a 7-day rental which can be shared is just not a lot of money), which is a shame because iFlipd has hidden potential for discovery. If you look at iFlipd in terms of its own revenue stream, it probably won't amount to enough to interest publishers. But when you consider it in terms of sales it can generate elsewhere then it suddenly becomes more appealing. I am talking about discovery. Between kids, work, and life, there are a lot of people who won't be able to finish a rented ebook in 7 days. They'll either need to rent it again, or go out and buy a copy - and that's where iFlipd offers value to publishers. It has the potential to generate ebook sales elsewhere, and what's more the sharing aspect could generate two sales. At the same time, iFlipd offers value to readers by letting them sample a book at low cost and low risk, giving them a chance to find ebooks they want to buy. So in addition to generating a small amount of rental revenue, iFlipd could also act as a catalyst for ebook sales. And that is an idea worth considering. I don't know that publishers should throw their own money at iFlipd, but I would definitely throw a few ebooks their way - much like HC and S&S have signed deals with Oyster and Scribd. One advantage iFlipd has over Oyster and Scribd is that the latter don't encourage additional sales; they in fact can discourage sales as readers spend more time reading in the Scribd or Oyster apps. iFlipd could well prove to work exactly the opposite. And what with HarperCollins and S&S both willing to experiment in the subscription ebook market, I think we could soon hear of similar deals with iFlipd. Not sure about Oyster, but I noticed recently that Scribd did have quite a few “sale only” titles listed. Mostly showed up in S&S’ subscription titles, like Janet Evanovich. Her first 3 Stephanie Plum books are subscription, the rest are not. So there’s some encouragement of sales, but for me, I’ll still wait til either the other books are in the subscription program, or get one at a place like Half Price Books. I do still make a very small purchase here or there, a deal on a favored author’s new book or such, but otherwise, it’s like paying for more stuff on cable when the bill is already too high and there’s plenty to see anyway. Scribd is a special case; in addition to the subscriptions service they also have an ebookstore.